This is the time of year that I seem to find myself outside more hours of the day than I'm inside. We eat breakfast and dinner outside, even when completing work on the computer I find myself sitting on the porch swing with the laptop just to be a part of the birds chirping and mild temperatures. I love Spring! 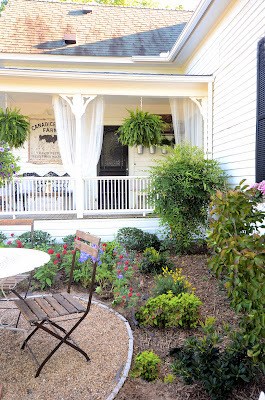 The farmhouse loves Spring too and it politely asked for a little Springtime freshening. Oh, do be careful what you ask for little farmhouse, for you surely may get it. When we began this project of freshing up the BACK porch and surrounding area, I asked for your input on the blog and FB. 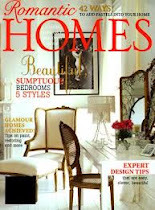 You overwhelmed us with over 70 great suggestions and ideas, many of which you will find incorporated into this space. 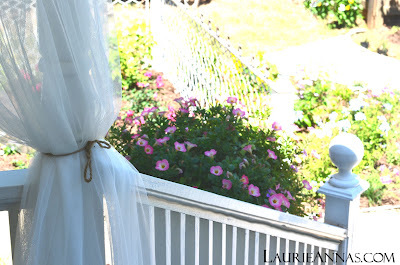 We started by hanging mosquito netting as drapes, we've done this with all of our porches throughout our marriage. 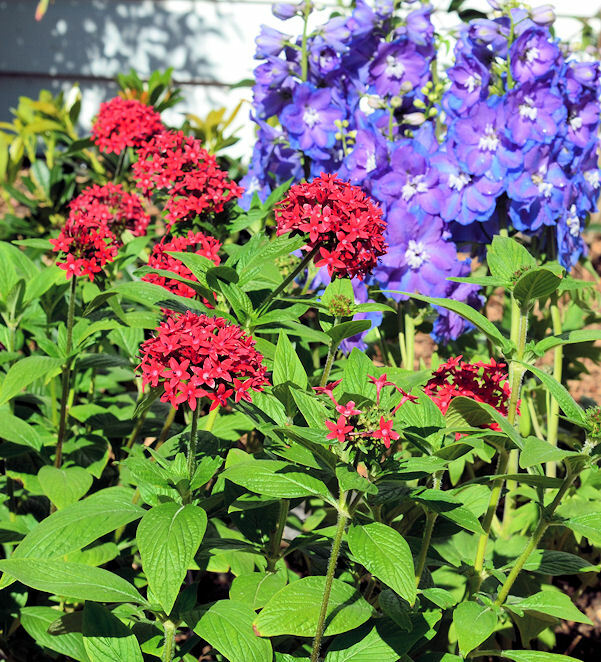 It not only softens the look, but it also helps to minimize bugs when it's untied. 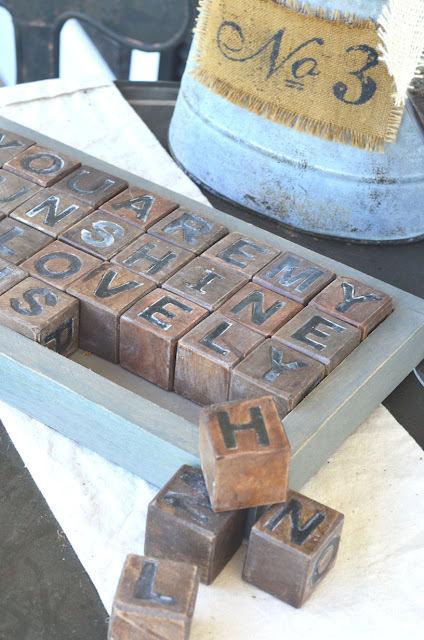 This old iron bench and vintage farmhouse sign look right at home here. I've had these antiquing finds in storage for almost a year....they've been waiting for their appointment. 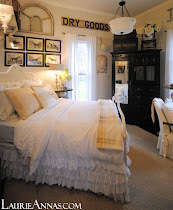 I love this vignette, especially with the farmhouse lighting peeking through to say hi. The black accents against the all white house really pop, it's a great mix. 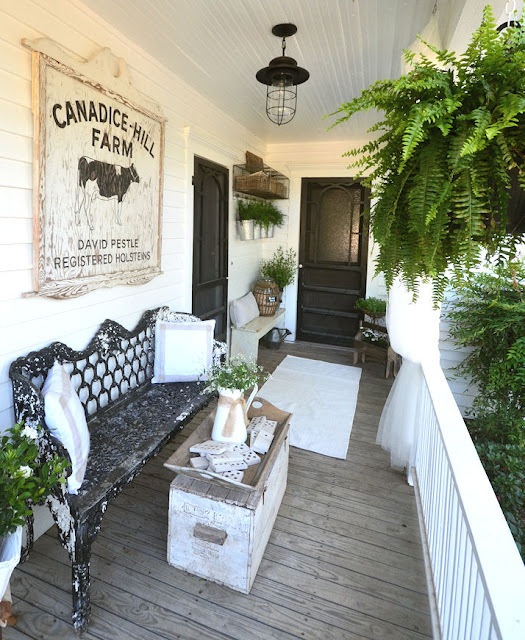 It wouldn't be a farmhouse porch without ferns, would it? And an abundance of fragrant Springtime blooms. 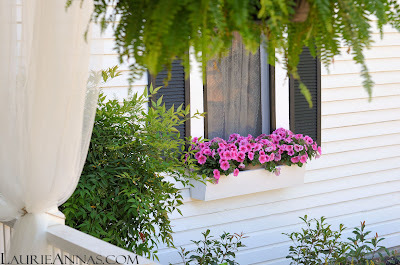 We jazzed up that lonely window on that super sized wall with shutters and a window box filled with pretty pink Petunias. 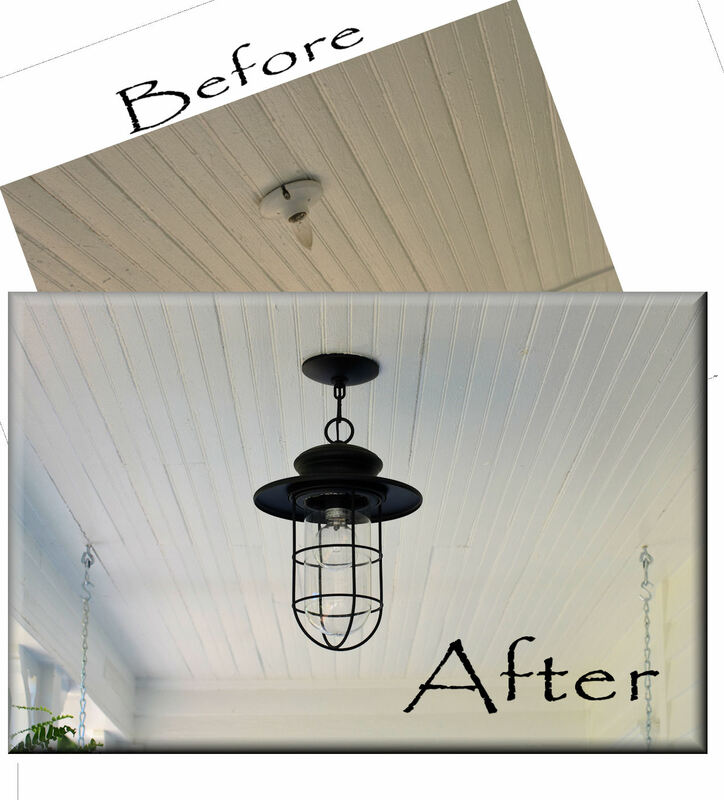 This was an easy inexpensive project that packed a huge punch. 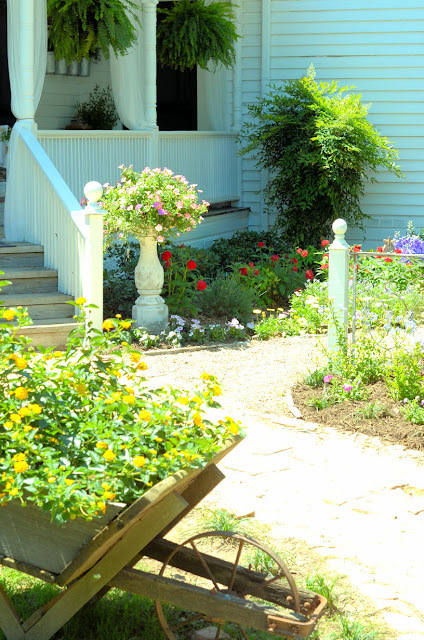 When we first viewed the property, one of the things I envisioned for the section of the backyard pictured above was a flower garden right off the back porch. Voila! I now refer to it now as the "key garden" because we shaped the walk to look like a keyhole. 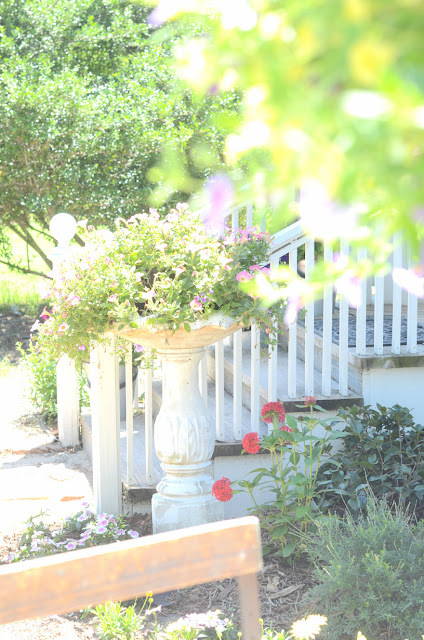 The short walk ends in a circle where we placed a table and some garden chairs that are completely surrounded by flowers, it smells heavenly. 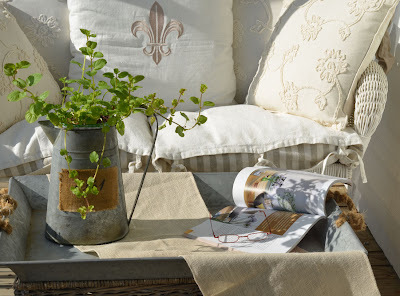 Cotton slipcovers can quickly be added to the garden chairs for entertaining. 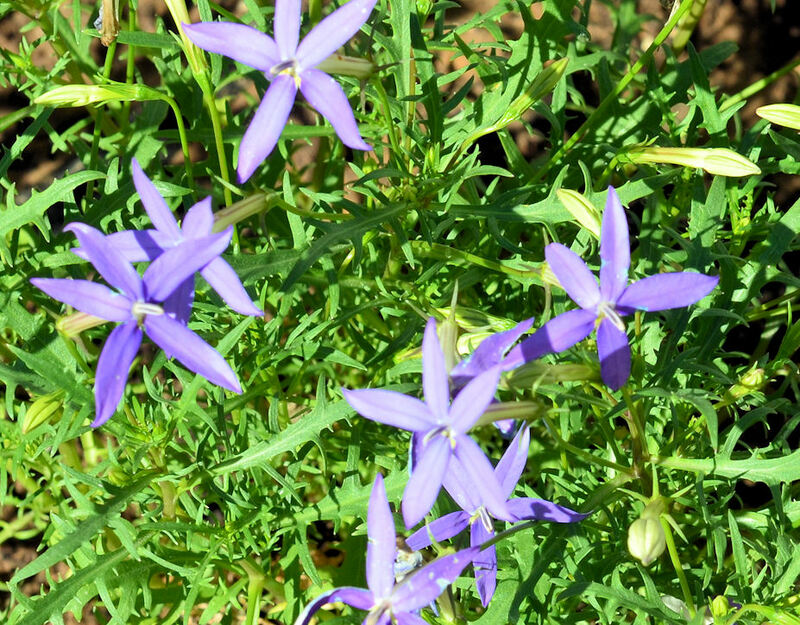 I planted various types of flowers, roses, daisies, plumbago, hummingbird bushes.....I can't wait until it matures and fills in. We've eaten breakfast here everyday this week and it's quickly becoming one of our favorite places. 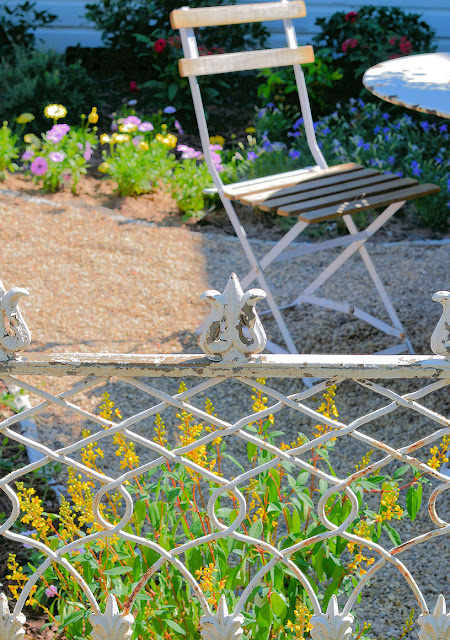 There's that wonderful antique iron fencing, we used a few sections of it to create a pretty divider for the garden. 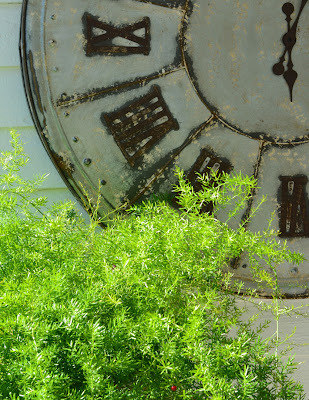 It adds so much charm and interest to the backyard and looks like it could have been here all along. A few months later he called me to tell me that the fence didn't work for the buyer and that it was for sale again. I never bought it and he never put it back in his store. You could have knocked me over with a feather when I called him a couple weeks ago to see if he still had it. We couldn't get there fast enough when he said HE DID! Perhaps it was meant to be at the farmhouse all along. 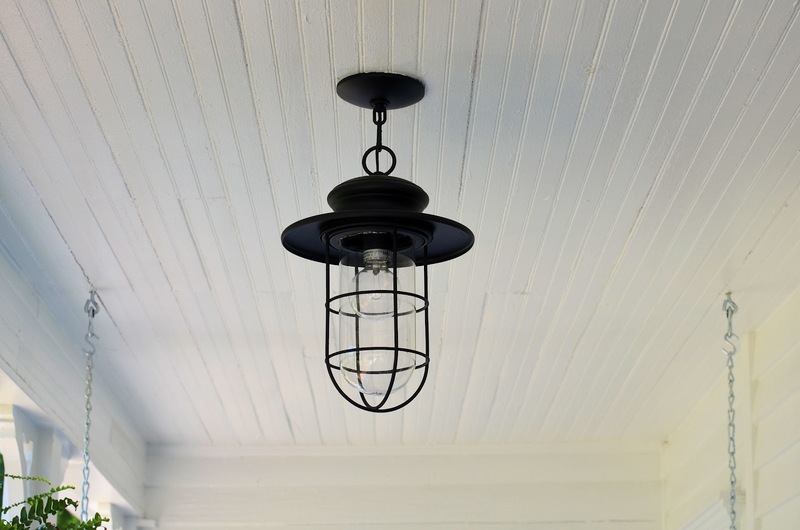 We hung several things on the porch walls, but they aren't just decorative accents, all of them add functionality or storage. Such as this shelf with cubbies and hooks. 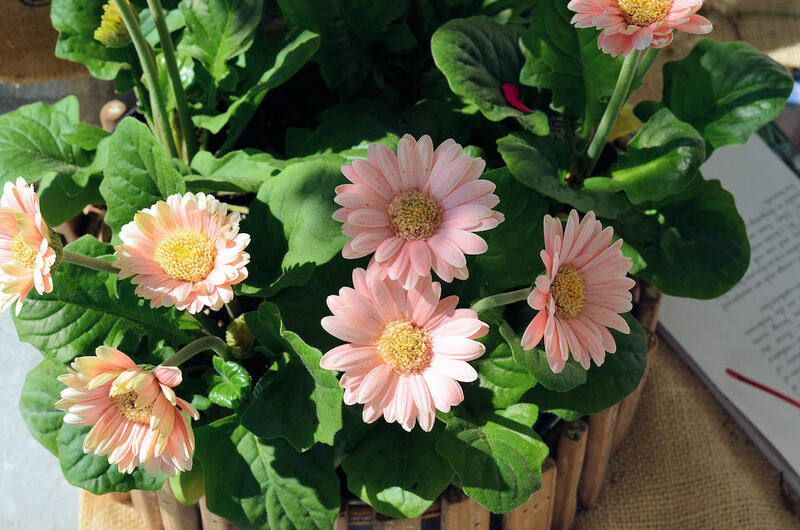 The wicker baskets that I placed inside the cubbies hold magazines, gardening gloves, insect repellent, and a variety of other porchy things. They hide all the mess. And that little bench is the perfect spot to remove gardening shoes and tuck them underneath. Many things were used for planters such as these galvanized buckets that are playing host for these pretty asparagus ferns. 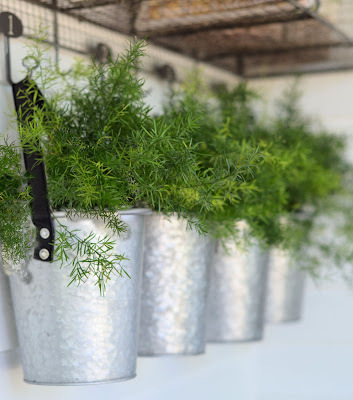 I also used this hanging wall pocket shelf as a planter, which I must confess is one of my favorite things right now. 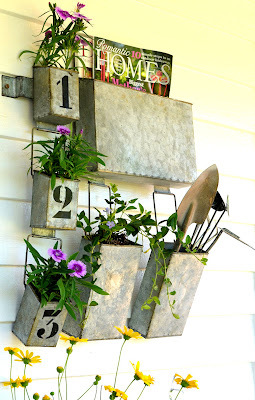 It offers such fun storage for garden tools and magazines among other things. 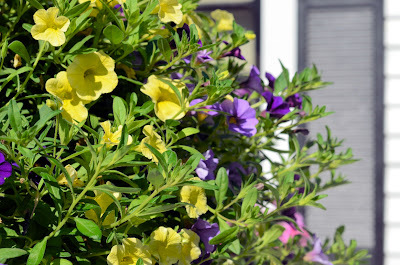 It was the perfect size to tuck a few small plants into some of the little pockets. Isn't that sweet? 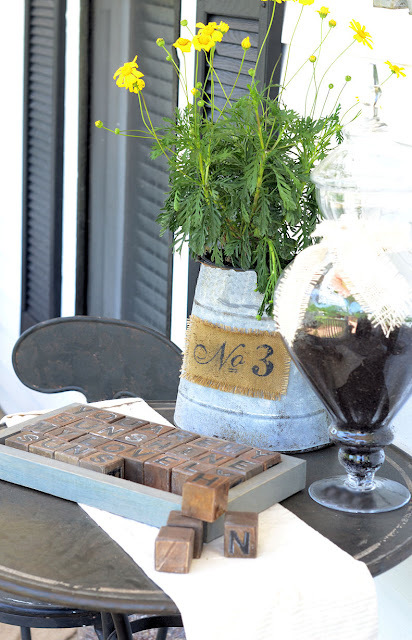 apothecary jars.... 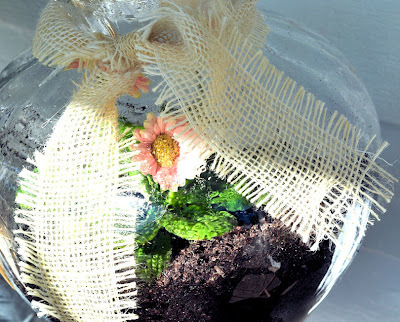 I've created many a terrarium in glass jars over the past decade. :-)) I didn't notice until I was uploading photos that there is not a single terracota pot on the porch...all the planters are other things. That wasn't a plan, and I certainly love pots, it just worked out that way. Another of my favorite things, my oversized wicker wrapped pickle jar that I filled with birdseed, it's so useful! this side of the porch because it contains the porch swing. I frequently find him dozing here. 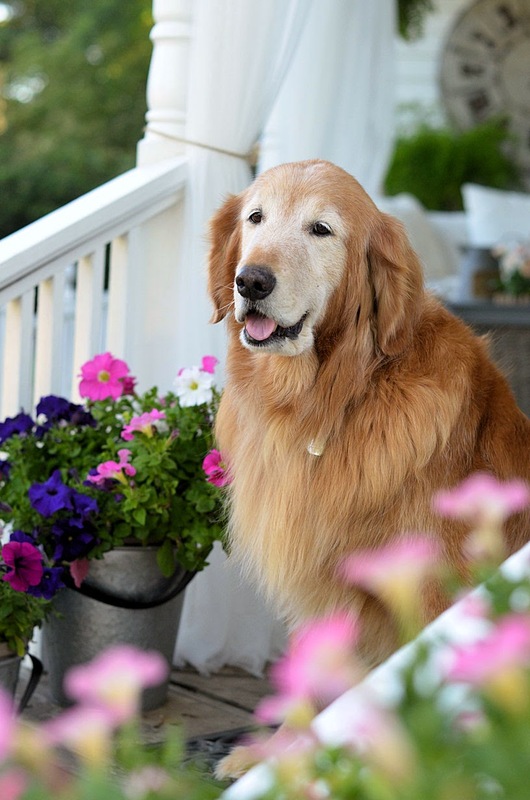 Zeek's favorite thing....just being with us on the porch. A group favorite thing...... before and after photos. its soooooooooo beautiful!!!! 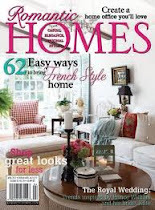 you can tell how much you love your home! It is gorgeous! I love the difference it makes. You are too humble..a huge difference! Great job to you and hubby. Looks like a great way to spend a lazy afternoon. Love everything!! Hey LaurieAnna. I am trying to think of one word to sum up what my thoughts are and all I can think of is AMAZING!! Your garden is amazing and your talents are amazing! Have a good weekend, my sweet friend. Yay!!! I've missed your party so much! 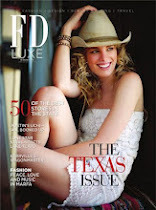 I happened upon it flipping through my blogroll just now. It's destiny! 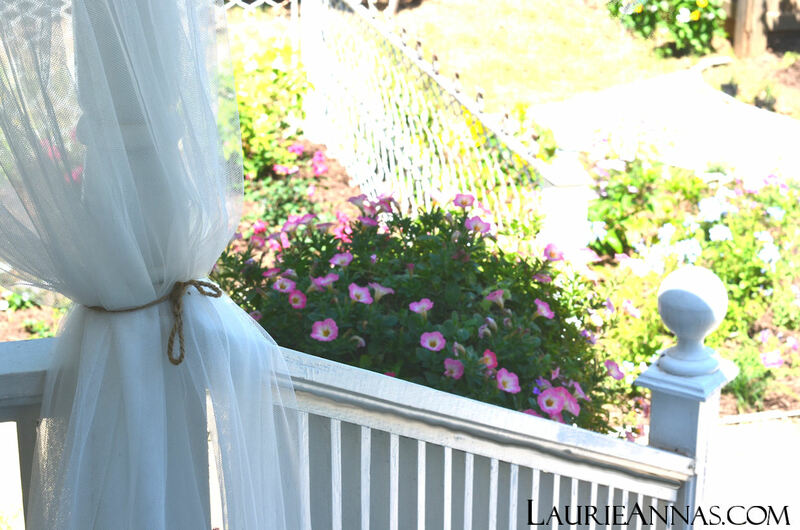 I love every touch, every texture, just everything about your additions...As usual your LaurieAnna touch makes it just beautiful! 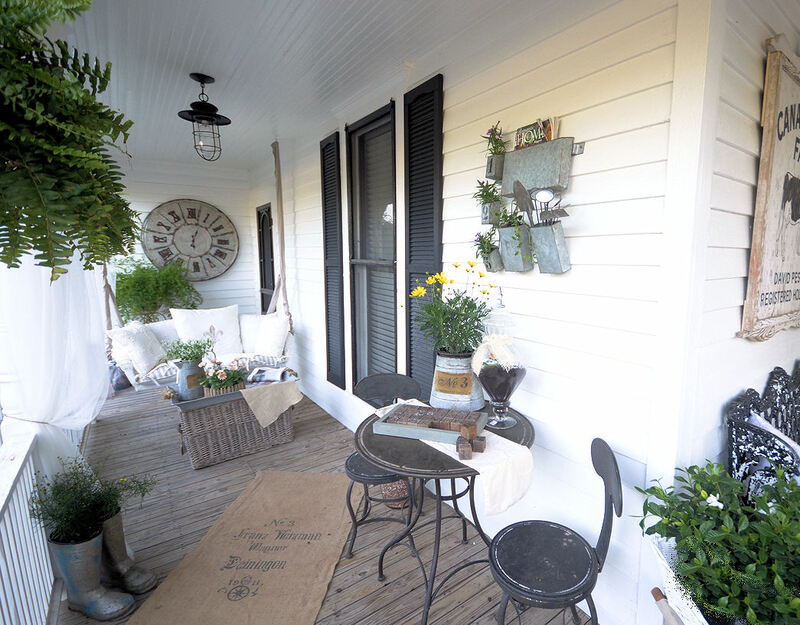 I absolutely love the way your back porch turned out. (Makes me long for a way of life that exists only hundreds of miles from here!) I'm going to have to think about adding some of those little touches here on the windy high plain. One word...STUNNING!!! 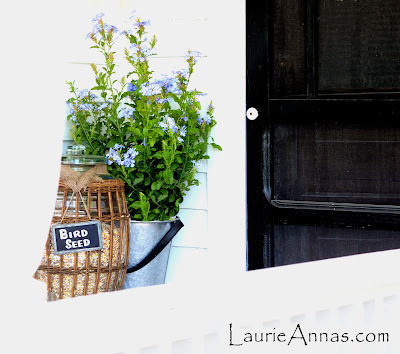 I am so much of a outdoor kinda of gal and I just LOVE your porch and garden. 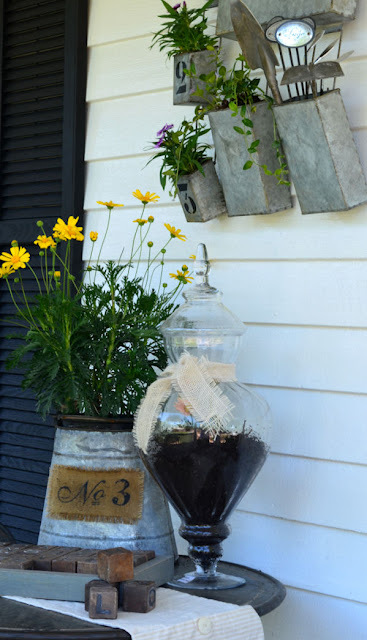 I have working on my porch...patio and garden the past few days and hope to get some posts out soon...thanks so much for sharing yours my friend. 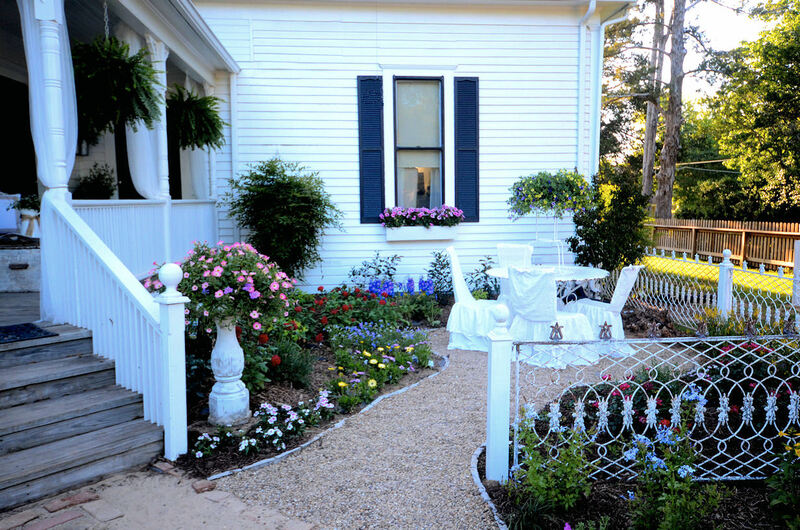 Charming and inviting! Thanks for sharing all these inspiring photos. It's beautiful - just beautiful! And I must know where you got your light! It's fabulous! Laurie, your back porch is breath taking! So many great ideas, big and small, and quite the dramatic makeover. I love the gardening and path, the mosquito nets are practical and add some pretty softness, and your accessories are so lovely. The dairy farm sign is my favourite piece. Your dog is a cutie, too. Just one word to say...beautiful!!!! I am just getting going here in Michigan...the weather is/has been crazy...but not giving up...working inside right now...just repainted the bedroom and now making a bedskirt...so much to do at "the cabin"!! 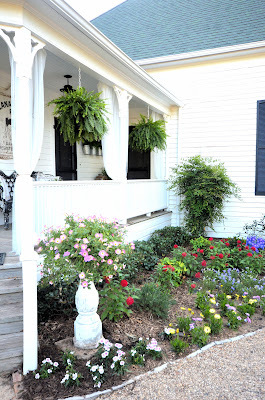 I love everything about your house, porch and garden. I really love that Canadice Hill Farm sign. Gorgeous! 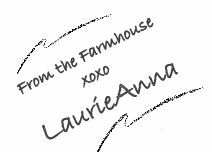 Oh my gosh, LaurieAnna! 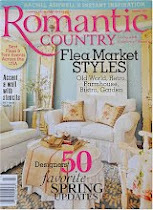 I ADORE the cozy factor you've created!!! It's totally amazing, girl!!! 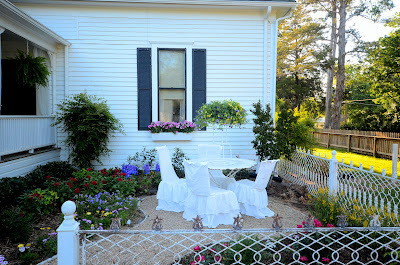 I truly love how the netting adds so much warmth and sweetness to the porch. 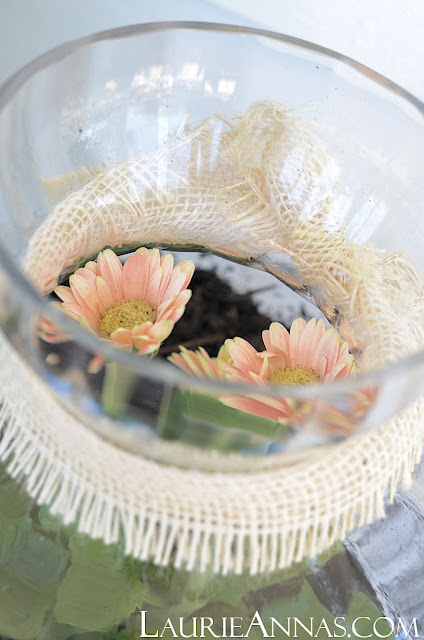 Where do you find that netting...and how did you hang it? Do you have to wash it frequently because of bugs...? Thank you for sharing these wonderful photos!!! 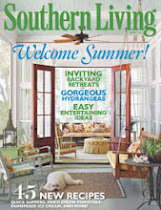 You are definitely ready for a terrific summer! Hope you will be able to kick your feet up and enjoy all you have done. We've still got a long way to go on our new porch but I am super excited to work lots of you inspiration into our new addition. Beautiful! It's too late for me to come up with a comment worthy of this transformation. :) Thanks for hosting! Your post today was so interesting I had to read it twice. What great ideas. I think the dark shutters made a huge visual difference. Thank you for sharing such a detailed series of photos and words. And thank you for hosting. Every picture on your post had something special to study and sigh over. What great ideas you have and what a special place you created for meals. 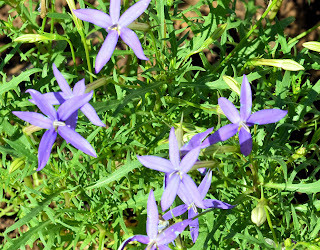 Thank you for sharing and thank you also for hosting. 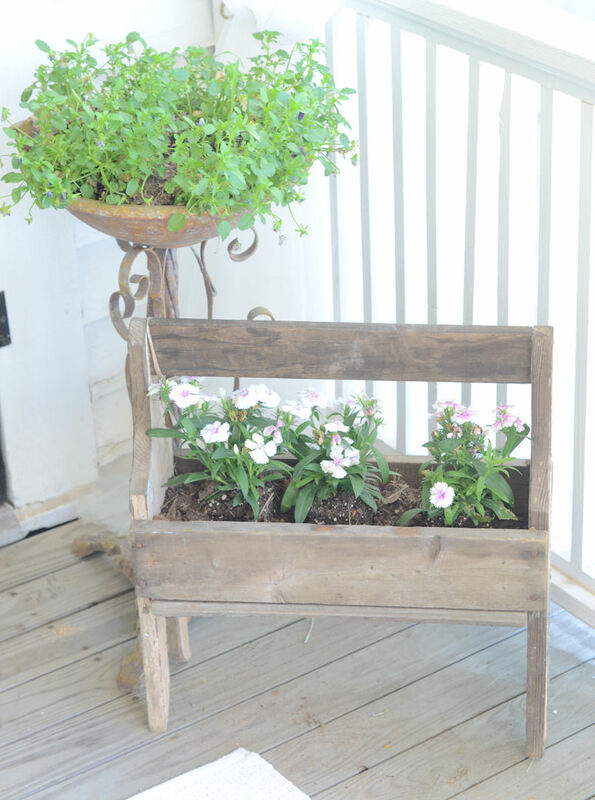 Your porch is simply beautiful! I love every touch, but I absolutely adore your vintage sign. Beautiful...,charming...elegant! I love it all!! Everything about it says welcome, right down to the dog! 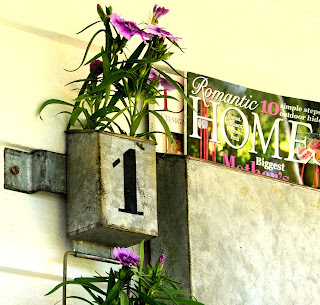 love, love, LOVE your porch and gardens!!! your attention to detail is amazing and so inspiring! 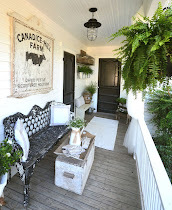 apparently, i am not the only one who loves it...i pinned an image of your porch 3 hours ago on Pinterest...and have had 86 repins already! i can't wait to see more of your home and gardens. 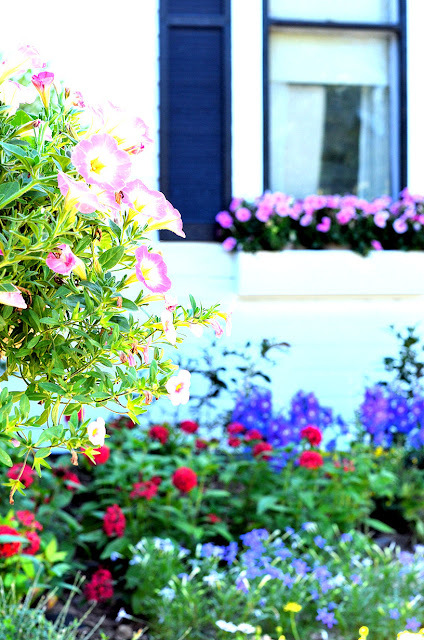 Your garden, back porch and home are just beautiful! Thanks so much for sharing your ideas! Okay....can I just say...I'm crazy in love with it all! 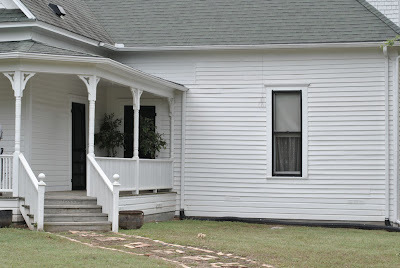 I live in a farmhouse too, with a large wrap around porch...and it's sat pretty much empty for 6 years...it's so sad. I love so many things about yours...thanks so much for the inspiration. So beautiful, I just love everything!! La maison du bonheur... Merci pour ce très merveilleux partage photographique. J'aime la manière avec un goût particulièrement de bon ton que vous avez eu de parfaire votre extérieur et votre pergola. STUNNING!!!! 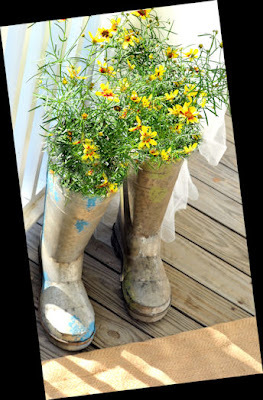 I wish it was my porch!!!!! WOW! What a transformation! The shutters make a HUGE difference. 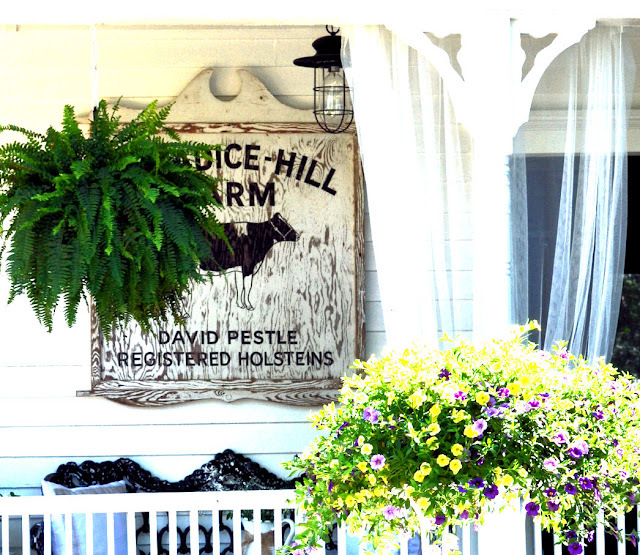 I love the garden fencing and that farm sign is amazing! So gorgeous - ENJOY my friend! Love, Love, Love your porch!!! I was wondering, where did you get the mosquito netting? I would love to add this to my porch! Your photos simply took my breath away! You are so very talented. 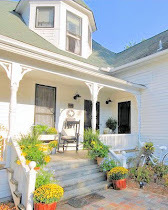 Love the porch and also the typewriter table in your banner! Your porch is beautiful. Can you please tell me where you found your lighting fixtures. They are wonderful. your garden and porch are inspirations. 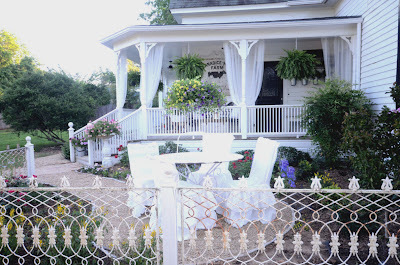 I've just posted some pictures of my dream yard. 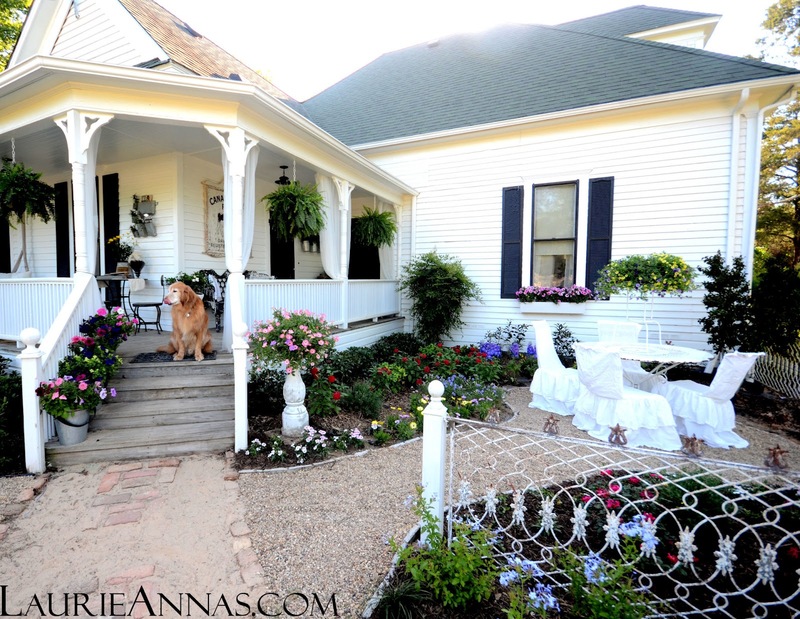 I have never seen something as perfect as your porch and garden. Will it be featured in a magazine soon? I certainly hope so. Please let up know which one so I can get my own copy. So beautiful. I love everything about the porch. We have the same taste, but I haven't even started on mine yet and I've lived here over a year! Wow. It's so welcoming and beautiful. I love your style! 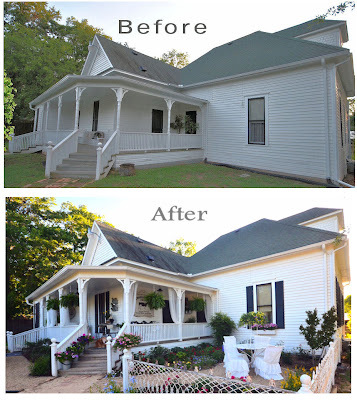 I recently moved into a 111-year-old farmhouse with a gorgeous, ornate wrap-around porch. I think I'll incorporate a few of your ideas when I decorate it. Visiting from Funky Junk Interiors. Following you on FB. I popped over from funky Junk too. I came for the pictures but am enjoying the music. Thank you for such beautiful inspiration. 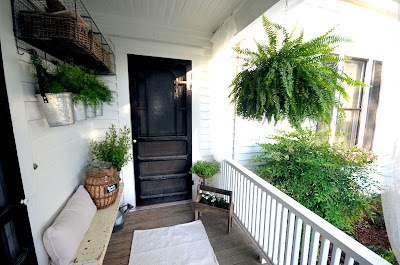 Found you on Funky Junk Interiors and just love your porch. Makes me want to stop and visit. will link up and be back to check out your other blogs. Stunning! Found you via FJI, but have seen the porch on Pinterest too. Enjoyed the entire tour today. Thank you for the inspiration. Your garden and porch is just BEAUTIFUL! So inspiring! 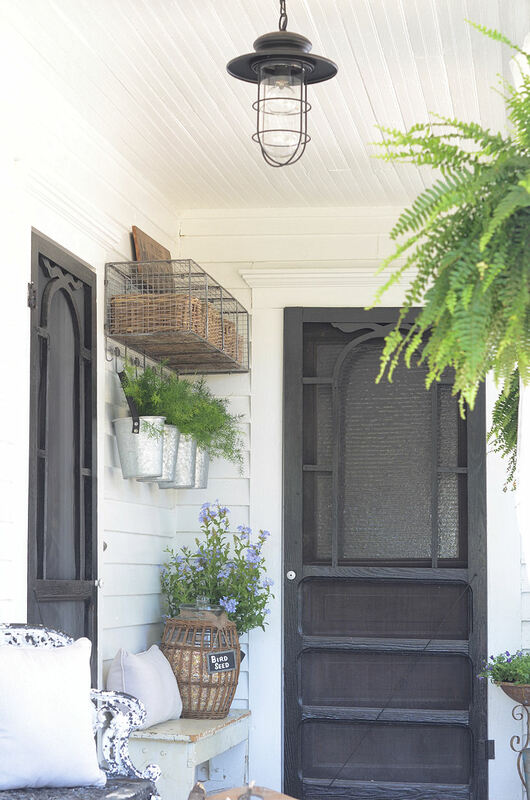 Love that beautiful porch! Everything is so very pretty and fresh looking. Now that it's winter I'm really missing sitting outside and eating. I'm even missing just being able to sit outside in my backyard. I tell you spring and summer come and go way to fast for my liking. Garden fencing can be one of the most eye appealing items on your personal property. 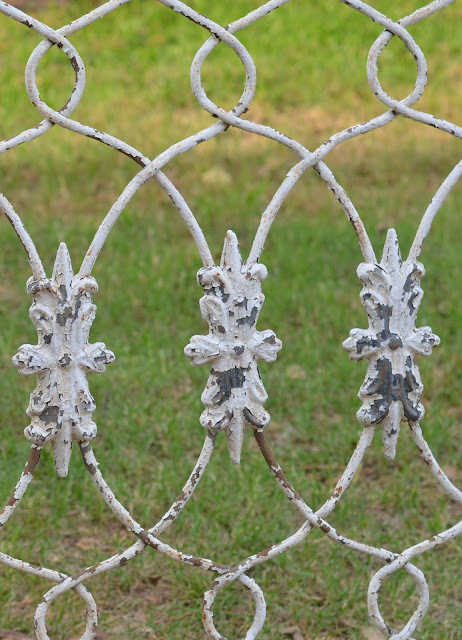 A fence that works with your home construction style and the garden it enhances completes the picture you have created for family and visitors alike. A friend and I visited your store in Canton last year. I can't get it out of my head. It was so much fun and I have enjoyed following you on Pinterest. The farmhouse is darling. Your store and ideas are like a mini-vacation for me!